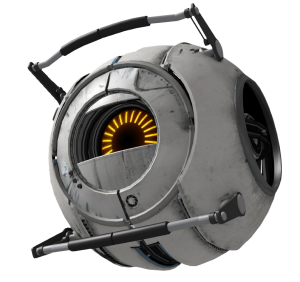 The Space Sphere (more commonly known as the Space Core) is a corrupted personality core of male programming who first appears in Portal 2. He is the first of three cores attached to Wheatley by Chell in order to initiate a Core Transfer Procedure. The Space Sphere is an example of a personality core that went insane. Because of this, the Space Sphere speaks in a hyperactive manner, constantly talking about his infatuation with outer space and how he would like to one day go to space. His dream of going to space is fulfilled after he gets sucked through a portal that sends him and Wheatley into space. However, a small portion of his dialogue states that he eventually gets bored of space and wants to return to Earth. After the song "Want You Gone" at the end of the game, the Space Sphere can be heard along with Wheatley. The Space Sphere, along with all the corrupted cores, is voiced by Nolan North. The Space Sphere on a shirt. The Space Sphere as seen in "Fall of the Space Core, Vol. 1"
The Space Sphere's character was inspired by an advertisement for the Oregon Coast Aquarium. The Space Sphere became a popular character on the Internet after the release of Portal 2. He is seen in parodies of popular culture videos. To celebrate The Elder Scrolls V: Skyrim coming to the Steam Workshop, Valve created a mod to have the Space Sphere drop into a nearby home just outside the city of Whiterun. In this mod he is known as the Space Core. ↑ Chapter 7, page 4 of Portal 2 - The Final Hours. This page was last modified on 27 October 2018, at 13:56.